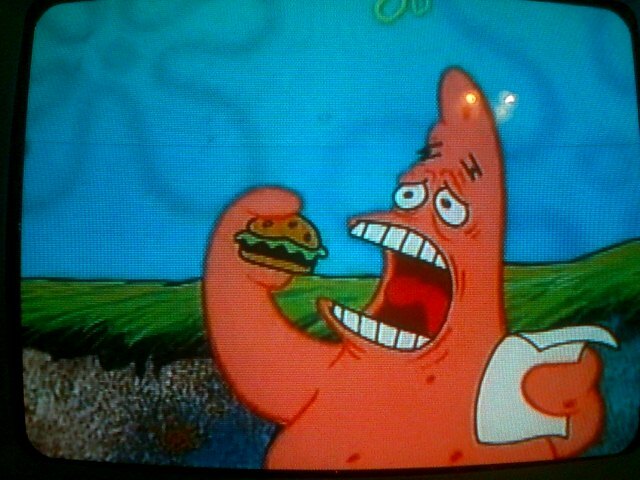 *Take bite*.... Picture of Patrick taking a bite of Krabby Patty in the episode "Nature Pants". He is sad and misses Spongebob, who ran away to Jellyfish fields, and after পাঠ করা the script Sandy gave him, attempts to take a bite of a Krabby Patty. Hilarious ♥. Wallpaper and background images in the স্পঞ্জবব চৌকোপ্যান্টেলুন l’éponge club tagged: spongebob patrick spongebob squarepants krabby patty nature pants picnic idiot face eat funny.